B&W 805 D3 review | What Hi-Fi? Such has been the consistency of B&W's design approach that it’s easy to dismiss recent generations of the 800 series as just more of the same. The general look has hardly changed over the last decade or so, and those curved cabinets have gone from looking futuristic to almost classical, though they still look attractive. The new B&W 805 D3 hardly goes out of its way to dispel the ‘more of the same’ notion, but start delving and you’ll find B&W’s engineers have left little unturned in their bid to improve performance. As before, the 805 D3s are the only standmounters in the range. They’re a two-way design, as 805s have always been, but here the drive unit complement is the most technologically exotic it has ever been. The Diamond dome tweeter remains a highlight, and despite appearances, in this latest form only the diaphragm is carried over from the last version. Every aspect of the design has been revisited, from the aluminium pod it sits in, to the motor system. Even the way the pod is decoupled from the cabinet (to reduce any ill-effects caused by the vibrations generated by the mid/bass unit) has been refined. If anything, the 16.5cm mid/bass driver is even more interesting. B&W has used Kevlar as a cone material for decades, so the move to a different material is something of a step-change for the company. The new material, called Continuum, has been developed in-house and is designed to take the key properties of Kevlar – the controlled break-up behaviour, good self damping and relatively low mass – to the next level. Unlike the diamond dome tweeter there isn’t a massive cost penalty in using Continuum, so don’t be surprised to see it appearing in other B&W products soon. A front-facing port tunes the bass performance. As is B&W’s way, the surface of this is dimpled like a golf ball, something that is meant to reduce any noise generated by the rapid movement of air through the port. That elegant cabinet retains the previous 805’s proportions but is subtly reshaped, and the internal bracing – known as Matrix – is revised to improve rigidity and resistance to vibration. Improvements in simulation software mean that the engineers were able to fine-tune cabinet performance to an even higher degree than before, trying different iterations before settling on a specific design. Overall build quality is excellent. B&W is no stranger to fine cabinets, and this one upholds that admirable tradition. The cabinet edges are crisp and everything fits together with well-engineered precision. It feels immensely rigid while the quality of finish is excellent. There are three standard finishes; the gloss black of our review sample, a satin white and rosenut. As before there is a dedicated stand – a smart combination of aluminium and MDF that suits the speaker well. Ours were mass-loaded to add stability, which proves worthwhile. The stands are available in black or silver. They aren't cheap at £600, but unlike past efforts they work really well, and once the speakers are bolted on, we have no reason to doubt the effectiveness of the pairing. If you’re thinking of buying a pair of 805 D3s, consider the partnering stands an essential purchase. Any speaker at this level needs top quality partnering equipment. We use Naim’s NDS/555PS streamer and Clearaudio’s Innovation Wood turntable as sources and Gamut’s D3i/D200i pre/power combination to provide the drive. While nominally an 8ohm load these speakers do dip down to a minimum of 4ohms impedance, which means you’ll need a suitably muscular amplifier to get the most out of them. Just make sure the amp has brains as well as brawn. At 42cm high these aren’t massive speakers, so despite an ability to deliver high volume levels we think they’ll work best in small to medium sized rooms. While it might be tempting to put them right up against a wall or even in a corner, we’d advise against such an approach, as it would unbalance the speaker’s sound. These need a bit of space to breathe. Keep away from all walls, and angle the front baffles a little towards the listening position. Get it right and the 805 D3s are capable of a wonderfully balanced performance, one with a soundstage that makes the speaker end of our listening room disappear. It’s a superbly focused image, nicely layered and stable. We listen to Orff’s Carmina Burana and are wowed by this standmounter’s ability to layer the soundstage and locate instruments and voices in specific positions within the sound field. The sense of openness is impressive, and is in part due to the tweeter’s out-of-cabinet position. These standmounters sound best when pushed hard. At low volume levels the delivery loses a little too much life for our tastes. It’s something to consider if you tend to play your music quietly. Things are nicely judged tonally. The speakers sound even, bar a slight smoothening-off at higher frequencies. We continue to love the way the diamond tweeter sounds; it’s crisp and insightful, but also impressively refined and clean sounding. Integration with the Continuum mid/bass unit is seamless, not only in terms of output but also character. Unlike some B&W speakers we’ve heard, these have a consistent presentation from low bass upwards. Dynamics? This Orff piece is a stern test in this respect and the 805s pass without issue. They deliver the music’s crescendos with composure and enthusiasm, refusing to harden-up or strain even at higher volumes. Sometimes an ability to cope with the big picture compromises a speaker’s ability to deal with the subtleties, but that’s not the case here. The 805s have plenty of finesse, as becomes clear when we switch to Bruce Springsteen Ghost of Tom Joad. Here the B&Ws show-off their ability to uncover low-level detail and arrange it in a musical and engaging manner. This isn’t a particularly dense production but we’re still taken by the speaker’s ability to carry the melody and the way they get to the emotional heart of the song. The Boss sounds as passionate as ever. There’s a level of clarity and insight here that is class leading. We can ask for no more than that. Moving to alt-J’s The Gospel of John Hurt reveals the B&Ws' fine handling of rhythm. They sound crisp and precise, managing to communicate the changing momentum of the music beautifully. The speakers’ innate refinement pays off here; the presentation avoiding the thin, hard edge we sometimes hear with this recording without spoiling the music’s sense of attack. There’s plenty of punch to the lows and a surprising amount of reach. While avoiding the slightly over-full quality of previous 805s in this region these D3s have a weighty bass that gives the overall sound plenty of authority and scale. 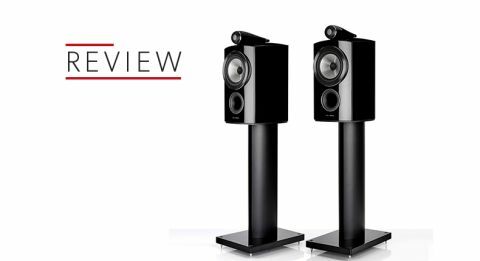 Though the price of the 805s has crept up over the years, this latest generation is without doubt the most capable we’ve heard. It uncovers low-level details most of the competition would barely hint at, yet combines it with enough in the way of dynamics and rhythmic drive to make things fun. These B&Ws don’t come cheap but they are excellent speakers.